I just wanted to post a picture of some monsters that I made to "resemble" my friend Sue's pets. They were a surprise gift from her husband and I think they turned out hilarious looking! Also, I was able to make another roadkill possum scarf... check it out! Enjoy the rest of 2010! I'll be working up some new things... I think it's time to shake up my monster designs a little bit and try something new. I get asked ALL the time what gave me the idea for my monsters. Here's a more fully explained answer... with some visual aids! well... sorta smoother. I didn't really get the "pick of the litter" as far as class choices went. So the one class I ended up with was "Ideation and Series" where we basically had to propose a idea for a body of work and then spend the final few weeks trying to pull it all together. Today I'd like to link you all up with some nifty things I've recently become a fan of. The first is a site called merrypad.com. Emily, the blogger, is a recent first time homebuyer and enthusiastic "do-it-yourself'er." She writes about all her projects, from larger construction issues like building a deck to smaller decorating projects. I love that she posts before and after pictures. You can browse through her site by room or by date. She has practical design ideas and everyday her site becomes an even better resource! 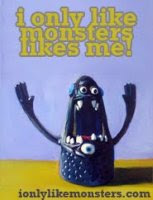 The second nifty thing is the art of fellow b'lo monster maker, Nicole Johnson. She creates "whimsical creepy fun strange cute weird one-of-a-kind decorative art dolls and creatures." I met Nicole at the ELAB Holiday Art Show and love her work! Check out her website at mealymonsterland.com. On another note, thanks to everyone who came out to support erinmakesstuff this weekend. I truly appreciate it. You guys are the best! So enjoy those links! I'll post more as I think of them! Change of date on the Northwood Elementary show: It has been pushed back a week until Saturday December 11, 9am - 4 pm. West Seneca got blessed with over 3 ft of snow these past 2 days and it stunk. People have been stuck on the 90 for over 24 hrs... it even made national news. Anyway, I changed the info under the EVENTS tab. So, if you were planning to stop by that event, don't come this weekend, come next weekend instead. I'm going to go build an igloo. Maybe I'll have another snowday tomorrow. Ice cube in the toilet, penny in the freezer and pjs inside out and backward. It's the first day of December and it's snowing like crazy outside. Although it's the second snowfall of the year, it's the first that has amounted to inches. I'm not one to get real excited about snow... to me it just means lousy driving conditions for my little old Mazda. It looks pretty from my window though. Here are the quadruplets that I finished up this past week. A whole ton of monster love right there, let me assure you.